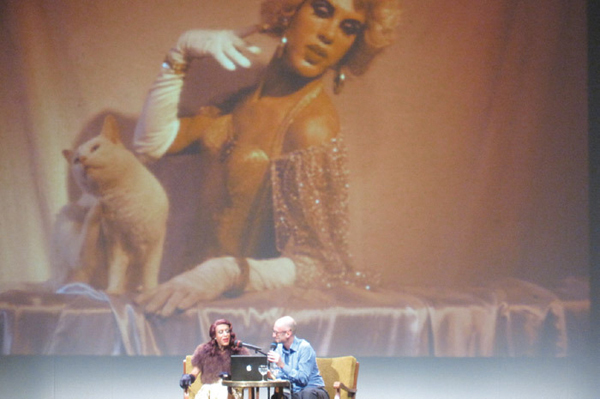 Mario Montez (René Rivera) in conversation with Marc Siegel at the “LIVE FILM! JACK SMITH! Five Flaming Days in a Rented World!” conference, Arsenal Institut für Film und Videokunst, Berlin, October 30, 2009. Photo: David Velasco. So reads the very first email I ever received from Mario Montez, who passed away at the age of seventy-eight on September 26, 2013. I remember clearly my quivering uncertainty about initially contacting him, despite the trust and encouragement I received from the dear, indispensable Agosto Machado, a wonderful performer and Montez’s longtime friend. Agosto, the entrusted Keeper of the Secret of Montez’s Florida whereabouts for almost thirty years, was somehow convinced by the kind words of mutual friends that I was to be the chosen one who should be granted access to the reclusive Superstar. Montez, of course, was the drag performer who debuted as “The Spanish Lady” in Jack Smith’s Flaming Creatures (1962–63) and then went on to reign over the New York underground film and theater scene in the 1960s and early ’70s. He delivered striking performances in over twenty films, including Normal Love (1963–65), Ron Rice’s Chumlum (1963), José Rodriguez Soltero’s Lupe (1966) and—perhaps most famously—many of Andy Warhol’s early films, including Harlot (1964), Screen Test #2 (1965), and Hedy (1966), before becoming a central figure in the Theatre of the Ridiculous. I wanted to contact Montez because I was working with actress Susanne Sachsse and Stefanie Schulte Strathaus, co-director of Berlin’s Arsenal Institute for Film and Video Art, on the festival “LIVE FILM! JACK SMITH! Five Flaming Days in a Rented World.” Ronald Tavel had tragically died on his return trip to Bangkok from the festival’s initial planning session and we thought of no greater honor to Tavel and Smith than an appearance by Montez at our fall festival. But I had never truly dreamed such a thing would be possible. Although I saw Montez and Machado in Mary Jordan's 2006 documentary Jack Smith and the Destruction of Atlantis, Montez hadn’t resurfaced for public appearances and seemed instead to slip back quietly into hiding. Even my friend Callie Angell, who had found (or found out about) practically everyone who had ever appeared in a scrap of film by Andy Warhol, didn’t have his contact information. Callie respected what she took to be Montez’s Garbo-esque wishes: to be left alone. So there I was, writing an email to Mario Montez as if writing a fan letter to some kind of Silver Screen Beyond. There are many myths about the reserved Montez that emerged in the absence of his own account. For this reason, it is all the more significant that he graciously decided to take up once again his public persona and share with audiences in Berlin, New York, Wroclaw, and Frankfurt over the past four years his memories about the “Underground Film (and Theater) Experience.” That experience happened decades ago in a city far from Orlando, Florida where Montez had settled after leaving New York, and where he had begun another phase in his life—one not about heterosexuality, but not about queer underground performance either. He therefore generously solicited others to work with him on the collective reconstruction of a history that he, most understandably, only partially recalled. Being privileged enough to facilitate and accompany him on this journey back to a formative time in his life and a time of immense inspiration for me and many others—that is something I will never cease to cherish. It gave me the opportunity to experience firsthand the dignity and humanity, the grandeur and down-home glamour, the seductive charm and casual wit so poignantly conveyed by Mario Montez’s star image. Marc Siegel is an assistant professor of film studies at the Goethe University in Frankurt am Main, Germany and is working on a book about Mario Montez.